In the first post of this series we started by exploring some of the underlying factors that affect your language learning journey. Now we’re going to dive right into the nitty gritty: learning vocabulary. In the early stages of learning a language there’s really only one thing you need to be focussed on, and that’s building your vocabulary. Whatever else you learn, if you don’t understand the words being used then you can’t communicate in the language. This means you need to get into the habit of recording useful words and phrases at every opportunity, and finding a system to learn them. Whether you’re reading a book or chatting in a standing bar, each time you come across some interesting language, only to forget it five minutes later, it’s really a wasted opportunity. There are two elements to this problem, writing words down, and reviewing them later. These are not the same things. For years, my bookshelves were full of notebooks and bits of scrap paper where I’d written things down that I wanted to learn. The problem, of course, is that I never actually got round to revising most of it. No-one wants to sit down and memorise things from notebooks! Writing stuff down is important, but it’s only half of the solution. Spaced repetition system (SRS) flashcard apps are the greatest thing that have emerged for language learners in the smartphone revolution. You’ve heard of flashcards, maybe even flashcard software for learning vocabulary. Flashcard apps allow you to quickly jot down new language wherever you come across it, and then revise it within the same app. The SRS function controls how often you see your flashcards. You indicate to the app how well you know each card, and the flashcards you know less well will appear more often. This highly efficient memorisation system lets you make the most out of every second you have. The beauty of it is in the simplicity. You can keep all your vocabulary in one place (no more scraps of paper!) and it’s always in your pocket for revising during your dead time. You might actually start looking forward to those 5-minute waits for the train, it’s a prime opportunity to get some quick studying done. Anki and Memrise have free web-based versions, but I recommend an actual app because it’s more reliable when you’re out and about. The only app which is affordable for iPhone and doesn’t require an internet connection is Flashcards Deluxe (my personal choice). Now I’m going to give you some basic pointers for making the most out of learning vocabulary with SRS apps. Don’t take this as gospel – play with the system and figure out what works best for you, but this is a good place to start. When you come across some useful language, open up the app and write it down on a new flashcard. Write it in Japanese on one side of the flashcard and the English translation on the other. How do I know what words to note down? You can’t record every word you come across. My approach would be to start by noting down anything that makes you say “That’s a cool word to know!” You’ll soon figure out how much is too much. Do I have to write it in Japanese? Yes. Start as you mean to go on. Use kanji if you can, hiragana if not, and English as a last resort. 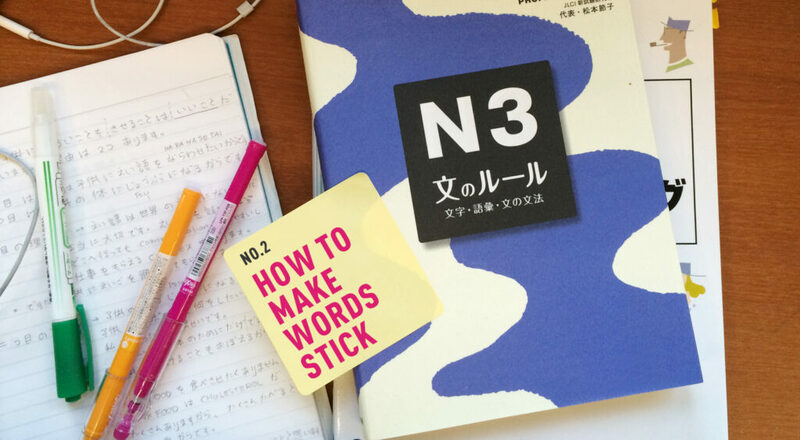 If you can’t write in Japanese on your phone – now would be a good time to learn! Always try to write new language in full sentences. Don’t just write one word on its own, write down the sentence in which it appears too. This won’t always be possible, especially if you’re jotting something down quickly in a bar, but it’s an important habit to get into. Here’s where the magic happens. The app will make this a very efficient process, but ultimately you’ve still got to do the work. Pull-out your phone whenever you get the chance and use the study function on the app to get that stuff learnt! Open your eyes and ears, be curious and proactive about new language. By choosing the vocabulary that you want to learn, rather than leaving it to the textbook writers to choose for you, you’re taking control of your learning and taking a big step forward. In lesson 3 we will look at hacking your day to create an immersive environment, even if you are not living in Japan!